Alien Hothouse is available through Amazon in mobi format (B017WF1ICE) and from Amazon and other retailers in paperback format (ISBN 9781518788574). Terminator and Terminator 2 are two movies that I would put onto my list of my all time great science fiction movies. In contrast, Terminator 3 and 4 were pretty much disasters. 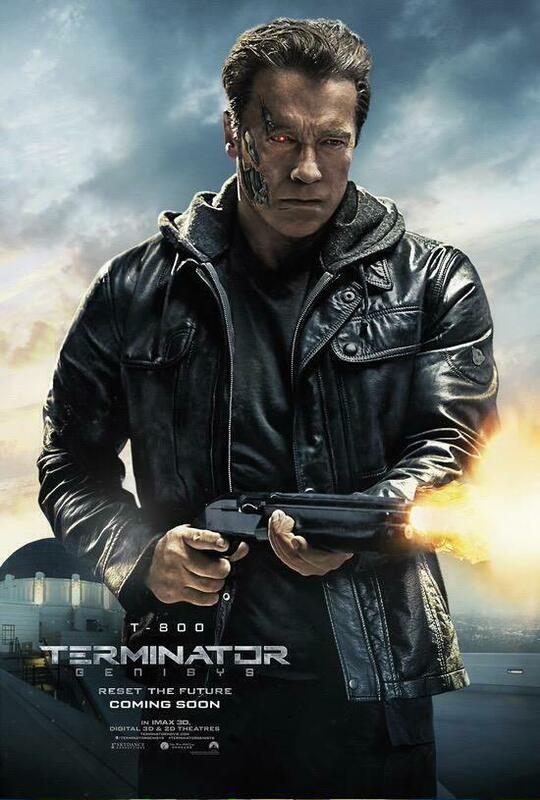 So when Terminator 5 Genisys was released, I wasn’t sure quite what to expect. Recently, I watched the Genisys and enjoyed it, although it didn’t have the same ruthless edge as the original movies. Perhaps that wasn’t surprising given the PG rating. In Genisys, Arnie Schwarzenegger is a cuddly ‘old but not obsolete’ terminator called ‘Pops’ acting as Sarah Connor’s guardian. The movie was entertaining and fun, but not really in the same category as the originals. The critics, of course, hammered the movie for it’s ecessive CGI sequences, complex plot, and apparent plot holes. Just google “Genisys Plot Holes” and you’ll see what I mean. But was all the criticism justified? It’s not easy writing a time travel story, particularly when it comes to time paradoxes. I know. My first novel, “Collision” was built around a time travel story-line and paradox, so I can appreciate the difficulties. There is of course very little science to support the concept of backward time travel: it is all fiction. But whatever ‘rules’ of time travel the writer invents must be applied consistently. Within the sc-fi sub-genre of time travel there are broadly three different approaches that writers have used over the years. an immutable time line approach, where whatever the time traveller does in the past is already reflected in history, so attempting to change the past has no effect on the present. a mutable time-line approach, where the time traveller can change the past and create a new time line that diverges from the original. or a multiple universe approach, where multiple time-lines exist and the time traveller can travel between them. A writer also has to deal with potential time paradoxes. For example, if a time traveller kills his parents before he is born does it mean the time traveller ceases to exist? In the movie Genisys, John Connor, says simply it doesn’t work like that. That is, the time traveler is cocooned or orphaned from the effects of his old time-line. Compare this with Back to the Future where Marty McFly starts to disappear at the Under the Sea dance when it seems his parents were not going to connect. Terminator appears to be using either a mutable time-line, or multiple universe approach; but which one is less than clear. In the original terminator movie, Skynet in 2027 was losing the battle against the humans and in a desperate attempt sends a terminator back to 1984 to kill Sarah Connor, the mother of John Connor, the leader of the human resistance, in order to change the outcome of the war. John Connor sends Kyle Reese back to 1984 to protect her. In 1984, the terminator eventually tracks them down in a factory. Reese is fatally wounded, but Sarah destroys the terminator in an industrial press and flees with her and Reese’s unborn son. This completes a paradoxical loop in time: John Connor sends his father to be back in time, so that he himself can come into existence. Tricky, but it’s not the only paradox in the storyline. Genisys starts in a similar manner to that described in Terminator 1 with the T850 Terminator and Kyle Reese being sent back from 2027 to 1984. However, during Reese’s transit something strange happens. Reese witnesses John Conner being attacked by a Genisys creature, he has memory flashes of an alternate childhood without the machines, and he arrives in a different 1984. This time the T850 is met by a battle-hardened Sarah Connor and an aging T850 guardian (Arnold Schwarzenegger) who are waiting for it and destroy it, while Kyle Reese is chased by a T1000 terminator posing as a cop. We learn that when Sarah was nine years old, a T1000 killed her parents, but she was rescued by the terminator guardian she now calls ‘Pops’. The movie never explains who sent the guardian back in time, or when this occurred — presumably from 2027. This is perhaps the largest unexplained plot hole in the movie. The importance of this point is that it provides a clean slate for a whole new story-line to unfold. If you think hard enough there are many other unanswered questions in Genisys, such as when was the T1000 sent back to kill the nine-year-old Sarah and whether this is the same as the T1000 in 1984; why Genisys sent a T850 at all to 1984 if it had T1000s available, and the list goes on. But if you think to deeply about it you’ll miss the fun of the movie. Maybe, these questions will be answered in the sequels planned if they are made. Lets hope Arnie will be back to explain it.